Even Ernest himself would probably have fled Key West's Hemingway Days celebration - a week of raucous tourists and swaggering Papa pretenders that send locals into hiding. Thus the low profile assumed by Gideon Lowry, playing his weekly piano gig at a quiet hotel, fighting his daily urge for a drink. That's where Asia - just Asia, like Madonna - finds him. Beret-clad, with lips the color of a plum, she glides into Gideon's world on the breathless end of a classic tune. She's left her aerie at MTV to find her estranged husband, who's lost in the reverie surrounding his obsession: Hemingway. But Asia doesn't want him back, she wants a divorce - and is ready to pay handsomely for it. What made the experience of listening to Night and Day the most enjoyable? Gideon Lowry was an enjoyable character to follow and I can see more of his case stories in my future. I love that this was set in the midst of all things Hemingway. John Leslie does a great job of bringing the characters to life and leading you through the clues as Gideon finds them. What other book might you compare Night and Day to and why? I have always enjoyed the Jack Reacher novels and the style of this novel is very similar to the Reacher series, but yet individual in style as well. Have you listened to any of David A. Wood’s other performances before? How does this one compare? This is the only performance by David Wood that I have listened to so far. I felt for the character when he realized that his relationship with Casey had changed to something totally different. I could sense a feeling of loss through the narrator's voice and inflection. David A. Wood does a really nice job of becoming the character. I loved this book by John Leslie. I found the narration to be very good and easy to listen to. David A Wood was able to convey the right emotions in his performance. My review is not a synopsis of the book, but rather my opinion of it. I was given this free review copy audiobook at my request and have voluntarily left this review. This book is part of a series and a standalone listen. The location of this book (Key West) was appealing to me and I found the author and narrator were able to give me so much imagery. Night and Day is Book 2 in the Gideon Lowry Key West Mysteries Series. Although it can easily be listened to as a standalone, I think that it is best enjoyed after listening to Book 1 for insight into Gideon's back story. Gideon is hired to find an estranged husband believed to be in Key West but the husband's murder opens up a whole other can of worms. With no shortage of suspects, including the wife, Gideon must solve the murder without getting killed in the process. I loved this audiobook and the series just keeps getting better. The story is made even more interesting with bits of the Key West culture and history. Once again the narration of David A. Wood was outstanding and immediately drew me in. His voice is the perfect "Gideon". I would highly recommend Night and Day. Night and Day by John Leslie was a good read. 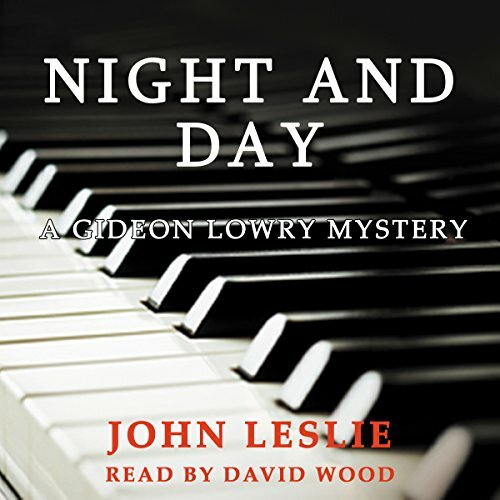 Gideon Lowry is a private investigator who is also a piano player. He located his clients husband but unfortunately he couldn't stop his murder. Lowry decides to investigate the murder. This was a good book. PI Gideon Lowry's former friendly flame is escorted out in a stilted but effective manner. Enter new, younger potential romantic interest with a songbird voice and a big problem, all of which gives N and D some lift without actually putting it into full flight. The new potential flame is tantalizing, alluring, and comes with all the excitements that draw a man to a woman and makes him want more until he realizes she doesn't have much depth, which makes him not care. I had a similar experience with N and D. The story holds super inticing potential without being fully delivered. The characters are stereotyped and barely interesting, and the premise is weakly plausible, both of which rip texture from the plot and-- even with a West Key backdrop and all the references to Earnest Hemingway-- leaves the story feeling a bit worn and lacking a genuine sense of place. The upshot is that audiobook comes with a pretty enticing preview of the next installment. I must say it hints very strongly of John Leslie upping his skills and stepping more strongly into his craft. I plan to check it out. Narrator David A. Wood gives a much improved performance from the first installment by pumping more life in both male and female character portrayals without being overly dramatic. I listened to half the tale at 1.5 speed before cranking it up to 2.0 with no problem. I was given this audiobook at my request and have voluntarily left this honest review. The previous book in the "Gideon Lowrey, Key West" mystery series. What does David A. Wood bring to the story that you wouldn’t experience if you just read the book? I enjoy David's interpretation, he has a listenable, interesting voice. With good pacing. I was comfortable taking brief breaks. In my opinion, this Audible work is worth the credit and my listening time. Thanks for the opportunity to listen and offer my opinions on this work! A review copy was gifted to me at no charge. In return, I am happy to provide an honest review. Also at no charge. Thank you Mr. Wood! Gideon Lowery, born and raised in Key West former Police officer turned PI and part time piano player has another mystery to solve in Key West. Gideon is hired by Asia, a well-known singer of MTV fame to locate her estranged husband. The story takes place during the annual Hemingway Days celebration and Asia’s estranged husband is found dead. Gideon is lead on an interesting chase in the world of the locals, visiting writers and big business. This is the second book in the series and I thoroughly enjoyed it. What did you love best about Night and Day? It brought back memories of our stay in Key West. What about David A. Wood’s performance did you like? His sultry voice was perfect for the characters. I do love a good book two in a series! The first book in this series was an introduction into the complicated life of Gideon Lowry. Book two showed his growth, broadened our understanding of the people in his world, and then put forth another really good mystery. The narrator was consistent and strong and he made Gideon real. I don't know if there is a book three in the series but if so, I'm all in.